The ideas within are a work in progress and are reflective of Katie's study and work of Laban Movement Analysis (LMA) that she started in 2009 while studying at Columbia College Chicago. The ideas have been refined and expanded upon through feedback from friends and colleagues, teaching the subject matter (Carthage College 2009, Miami-Dade College 2010-2011, UW-Milwaukee 2012-2013), and conference presentations (Bill Evans International Somatics Conference 2015, and NDEO National Conference 2015). If you would like to use the material, please cite Katie C. Sopoci Drake as the source. 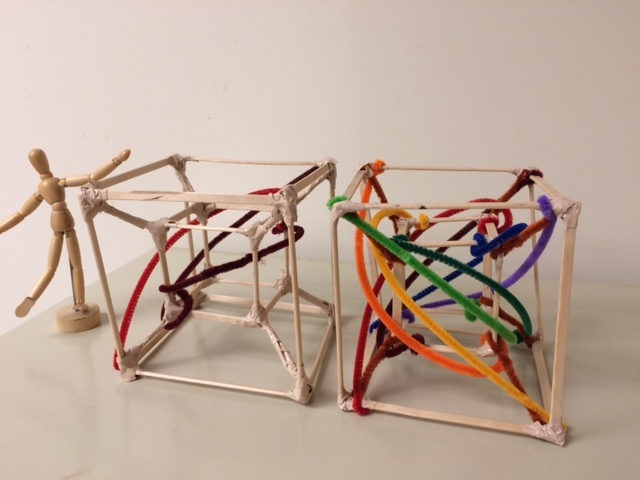 When learning or exploring Laban’s effort qualities of weight, space, time, and flow, students and artists are presented with a spatial affinity for only three out of the four effort factors. Flow is conventionally not linked to a spatial affinity. The dimensional and diagonal scales, when demonstrated with their corresponding effort affinities, are commonly used as aids for learning the effort factors as well as a tool for recall. By including a spatial affinity for flow, we add a means of including flow in the physical practice of learning and exploring all four effort factors and their many combinations. Besides gaining additional physical access to learning complex effort combinations, we also gain many new movement scales and many more potential avenues of creative exploration. The spatial affinity for flow is the Kinesphere. The kinesphere is the area that your body takes up. It is also, arguably, the space that you could potentially fill, either because your energy extends into it, or because of the predictable pathways you are setting up with your movement indicate you may easily pass into that space. It is often represented by a sphere surrounding the body, much like the pathway of electron around a nucleus is represented by a sphere. The kinesphere and, by extension, flow, is the transformation agent for the 3 dimensions & efforts, without which, it might be implied that the dimensions would travel interminably onward in a straight line. It acts to push and pull the other dimensions in relation to our own gravitational center. It can also be likened to space-time, the commonly referenced “4th dimension” that is explained by Einstein’s special theory of relativity. Quite simply, it curves space. Fun fact: you must always be moving through time, but you do not always have to be moving through space. Previously we only had a spatial model to practice 6 out of 8 effort elements, 12 out of 24 combinations of 2 effort factors and their elements (States), 8 out of 32 combinations of 3 effort factors and their elements (Drives), and 0 out of 16 combinations of 4 effort factors and their elements (Complete Drive). That's only 26 out of 80 total effort elements and all the possible combinations of the effort elements. Now we have access to all 80 of them. Click the links below to access the scales and affinities for the states, combinations of 2 effort factors and their elements. Like all affinities within BESS, the affinities are helpers or tools for exploration, and the efforts are not limited to these affinities. Note that each state is paired with its polar opposite. The first state's affinity is a plane and the second's is 1-manifold object (represented by a line) that sits in the axis the first plane spins on. The going-ness of the flow/kinesphere affinity, when combined with an additional dimension, forces the pathway out of a single dimension. In a single dimension, we have one spatial pull determined by the direction we are headed. For example: in the sagittal dimension, you are either headed forward or backward. When a second pull, in relation to Place Center, is added, it draws the other dimension either incrementally closer to Place Center, or acts to propel it away much like the effect a star has on a comet. Click the links below to access the scales and affinities for the Drives, combinations of 3 effort factors and their elements. Like all affinities within BESS, the affinities are helpers or tools for exploration, and the efforts are not limited to these affinities. Note that the 3 "Transformation" Drives (Spell, Vision, Passion) have an affinity to 2-manifold objects which are represented "locally" by planes. We imagine traversing the surface of these objects knowing that we might eventually encounter the spot we started out from without having to turn back around. 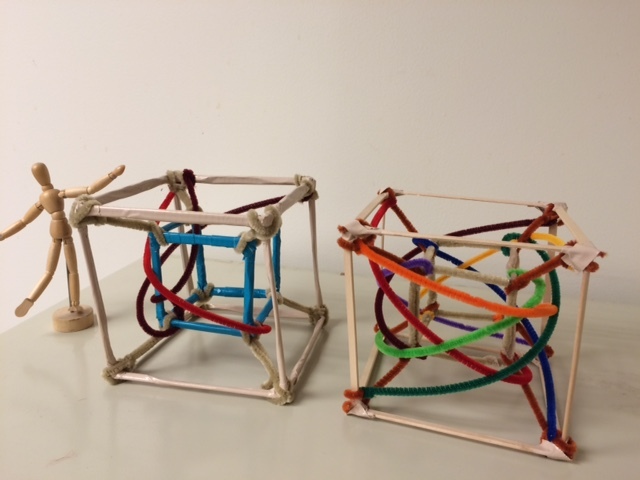 The Icosahedron with the Drives: craft sticks, pipe cleaner, duct tape, and about 3 episodes of Murder She Wrote. A Note On Color: Upon the advice of Peggy Hackney after my conference presentation at the 2nd Annual Bill Evans International Somatics Conference in July, 2015 I've been playing around with the colors for the dimensions, states and drives. I like the idea of the primary colors representing the dimensions, but would like to avoid duplicating efforts of others who have studied Jung and color theory. Let's say, this arm of the research is pending. Feel free to send info my way. The going-ness of the flow/kinesphere affinity, when combined with two additional dimensional pulls, forces the pathway into a spiral. In a plane, we have two spatial pulls. For example: in the horizonal plane, the two pulls are the horizontal dimension (primary) and the sagittal dimension (secondary). When a third pull, in relation to Place Center, is added, it draws the other two dimensions either incrementally closer to Place Center, or acts to propel them away much like the arms of a spiral galaxy. The most exciting thing about flow's affinity to the kinesphere is that it gives us spatial access to a complete drive: all 4 effort factors at once. I have represented this in the 4-dimensional analogue to the cube, the tesseract. Tesseracts (or hypercubes) are 4-dimensional, 8-celled figures that are translated into a 3-dimensional “projection” so we, as 3-dimensional beings, can imagine them. 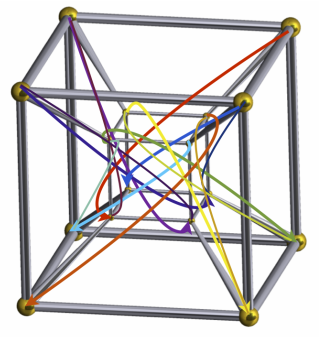 To put it plainly: compared to a cube which has 6 faces, 8 vertices, and 12 edges; a tesseract has 24 faces, 16 vertices, and 32 edges. Not only does this give us more edges to and vertices to explore, and a lovely physical model to practice all 16 effort combinations of the complete drive, but it provides a creative means "seeing" or experiencing the 4th dimension on our 3 dimensional bodies. The going-ness of the flow/kinesphere affinity, when combined with three additional dimensional pulls, forces the pathway into a spiral. In a cube, we have three spatial pulls that pull us equally from one corner of the cube to its opposite corner along a straight line. When a fourth pull, in relation to Place Center, is added, it draws the other three dimensions either incrementally closer to Place Center, or acts to propel them away. 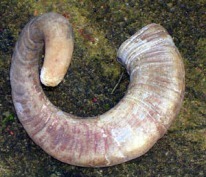 This forms a 3-dimensional spiral much like a ram's horn. The binding and freeing of flow is often described as carefulness vs. carelessness, or an energetic attention inward vs. outward. We often experience a shift in inner/outer focus when practicing moving from a bound movement such as removing a bug from our eye to a freeing movement such as tossing said bug far into the field to get it away from ourselves. When flow is affined to the kinesphere, we can imagine it as a tool to help access our inner/outer focus as well as our understanding of lower and higher dimensions. We might imagine the kinesphere like a hypersphere; it can be large or small, but unlike the sphere, there is no hidden inside or edge; there is only a going-ness that is equal parts expansion and contraction. When we expand our energies outward, we can examine how our inner life might contract to accommodate, and so on. The polarity model of the singular dimensions (a line whose ends never meet) are transformed by the kinesphere/flow affinity into a pathway whose ends may meet along a 1-manifold object. As 3 dimensional beings, we use physical approximations of pathways to imagine how our bodies might traverse space in lower dimensions (1 dimensional lines or 2 dimensional planes). We can also use physical approximations to imagine how our bodies might traverse space in higher dimensions (4 dimensional tesseracts). These pathways are simply tools for expanding our notion of how a body can move through space as well as using our imaginations to greater understand our relationship to space and to ourselves both in a local and universal sense. The solo "Event Horizon" from Spacetime Suite is a creative arm of my experiments with the expansion and contraction of the kinesphere and its affinity to flow. The themes of the solo explore the connections between hitting the event horizon of a black hole and being on the edge of making a decision that will drastically change the course of a life.